Your garage door consists of many different working parts, but undoubtedly the most important ones are its springs. These hardworking components are in charge of supporting the weight of the door panels, and are therefore under a lot of tension day in and day out. When they break, they can be extremely dangerous and will render your door inoperable. That's why professional assistance is always required when dealing with any type of spring related issue. 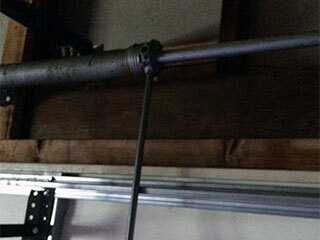 Every garage door system uses one of the two main types of springs. Extension springs are the older variety. They are placed on either side of the horizontal track, stretching towards the inside of your garage, parallel to the ceilling. These components are usually more suitable for doors of a lighter weight, as the nature of their action, stretching and contracting, makes them far more susceptible to wear and tear damage. Torsion springs, on the other hand, are placed on the wall above the door's opening, parallel to the horizontal side of the door. These types of springs twist and unwind, and they are therefore considered the ideal choice for heavier doors, as they much more durable. If you find that your overhead door has started to tilt, and its panels are unbalanced, then some careful spring adjustment is required. We already went over the dangers involved in the operation of these components, so this procedure should only be performed by professional technicians. While we're at it, our team will also lubricate your springs to make sure their operation remains smooth and efficient. This will also keep them from squeaking. Although regular lubrication and adjustment can go a long way in preventing spring related problems and extending the lifespan of these hardworking components, there is something else you may want to consider. Galvanized springs can be a great choice for homeowners who live in moisture-prone climates. Galvanized components can resist corrosion much better and are therefore more likely to last for a longer period of time. Whether you need torsion spring repair or broken extension spring replacement, you can always count on our experts at Garage Door Repair Huntington Station to provide you with a fast solution. Call us today.